Rhinoceros, often abbreviated to rhino, is a group of five extant species of odd-toed ungulates in the family Rhinocerotidae. Two of these species are native to Africa and three to Southern Asia. Horse, zebra and tapir are the closest relatives of rhino. The African species are the white and black rhinoceroses, and both species have two horns. Asian rhinos include the Indian (or great one-horned rhinoceros) and the Javan, each with one horn, and the Sumatran, which has two. Rhino can reach 6 feet in height, 11 feet in length and weigh up to 6000 pounds. Despite its huge body size, it has very small brain. The largest rhino species is the white rhino. It grows to 3.7 to 4 meters (12 to 13 feet) long and up to 1.8 meters (6 feet) from hoof to shoulder. It weighs around 2,300 kilograms (5,000 lbs). Two types of rhinos live in Africa: white and black. White rhino is not white at all. It has brownish skin and it has wider mouth compared to black rhino. The smallest rhino species is the Sumatran rhino. It grows to 2.5 to 3 meters (8 to 10 feet) long and up to 1.5 meters (4.8 feet) from hoof to shoulder. The Sumatran rhino weighs around 800 kg (1,765 lbs.). Javan rhinoceros is the rarest of all species. Only 50 animals are left in the wild. This species looks like its body is covered with heavy plates. These plates are actually folds of the skin. Rhinoceroses are herbivores, which means they eat only vegetation. The type of vegetation they eat varies by species. This is because their snouts are different shapes to accommodate different types of food. For example, the black rhino eats trees or bushes because its long lips allow it to pick leaves and fruit from up high. The white rhino has a flat-shaped snout that lets it get closer to the ground for eating grass. Although their skin is thick, it is soft and can suffer sunburn. Rhinos cover themselves with mud to create protective layer on the skin. Mud protects their skin from insects also. Rhinos live up to 35 – 40 years in the wild and up to 50 years in captivity. Rhinos are herbivorous animals (eat only plants). They eat grass, shrubs, leaves and shoots. It is a solitary animal, active mainly at night. Rhinoa horns are made of the same substance (called keratin) that makes our nails. There is about 5,000 Black Rhino , 20,000 White Rhino , 150 – 200 Sumatran Rhino, 35 – 45 Javan Rhino, 3,600 Indian Rhino. Different species have different number of horns: Indian and Javan rhinoceros have one horn, while White, Black and Sumatran rhinos have two horns. Every two and a half to five years, a female rhino will reproduce. 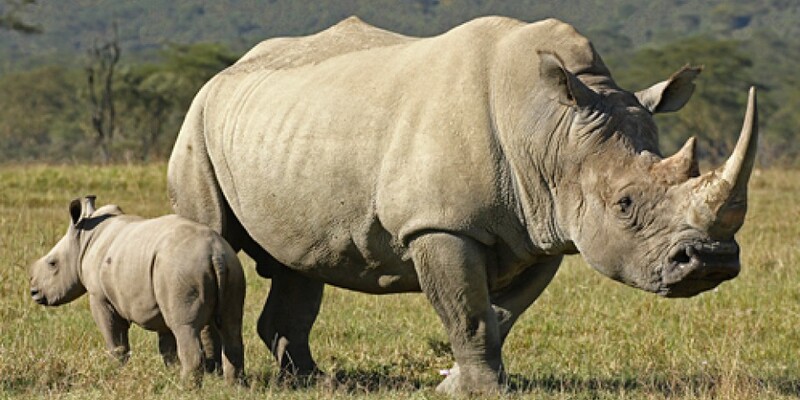 Female rhinos carry their young for a gestation period of 15 to 16 months. Although they nurse for a year, calves are able to begin eating vegetation one week after birth. At around 3 years old, the calf will set out on its own. Longest measured horn was 4 feet and 9 inches long. A rhino has very few predators, although a lion may try to take a calf. A spotted hyena is a more serious threat, but man is the deadliest of all. Small birds called oxpeckers remove ticks and other insects from rhino's skin. Because the animals’ horns are used in folk medicine for their supposed healing properties, rhinos have been hunted nearly to extinction. Their horns are sometimes sold as trophies or decorations, but more often they are ground up and used in traditional Chinese medicine. Rhino is a fast running animal. It can run up to 40 miles per hour. Rhinos rank among the most endangered species on Earth. Rhinos have poor eyesight, but they have excellent sense of smell and hearing. The black rhinoceros is in fact grey in color. They often assume the colour of the local soil in which they wallow. Group of rhinos is called a crash. Black rhinos fight often against each other. 50% of males and 30% of females die as a result of the fight. When rhinos are happy, they make a loud “mmwonk” sound with their mouths. Pregnancy lasts between 14 and 18 months and mother takes a good care of her baby. Young rhino will leave its mother 2-4 years after it is born. Though rhinos don’t often hang out with each other, they do hang out with birds. The oxpecker will sit on a rhino’s back and eat the bugs that crawl on the rhino’s skin. That’s not the only thing this bird is good for. When danger approaches, the bird will call out, warning the rhino. Rhinos live 40-45 years in the wild. Rhino horns are made of keratin, which is also the key component of human hair and fingernails. But the horns are not just dense clumps of hair. CT scans have shown dense mineral deposits of calcium and melanin in the core of the horn. The woolly rhino died out about 10,000 years ago. Fossils have been discovered throughout Europe and Asia.Early humans hunted these animals, and they were depicted in paintings on cave walls in France 30,000 years ago.